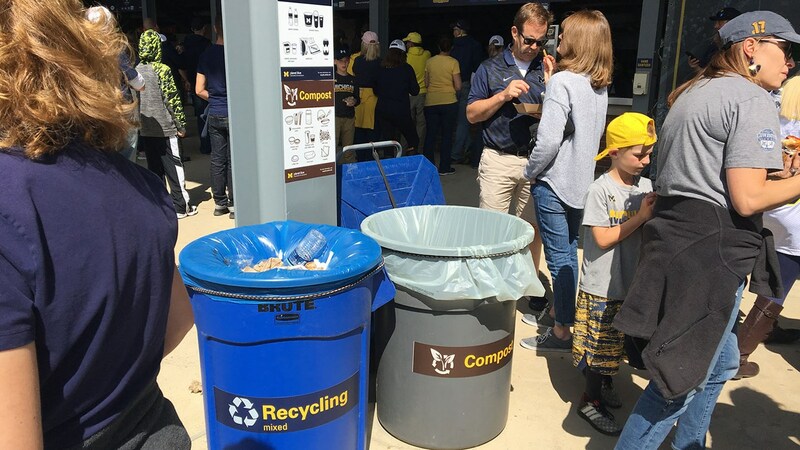 After joining a University of Michigan sustainability initiative in 2015, U-M Athletics reached the industry standard for zero waste with over a 90 percent diversion rate during the Rutgers game. For the season Michigan averaged a diversion rate of 88.17 percent. New Signage: In the summer of 2017, the U-M athletic department worked with the Office of Campus Sustainability on campus to create new signage that fit the Planet Blue branding staff and students see all across campus. Compost: Nearly all food and beverage containers were compostable in 2017. Recycling: Fans once again had the option to purchase souvenir concession items that were recyclable along with water bottles and plastic containers. The new signage was placed on every waste win and on walls or posts throughout the concourse and inside the stadium suites to help educate fans on where to place their waste items. A complete list of products and which category they fall under can be found here. 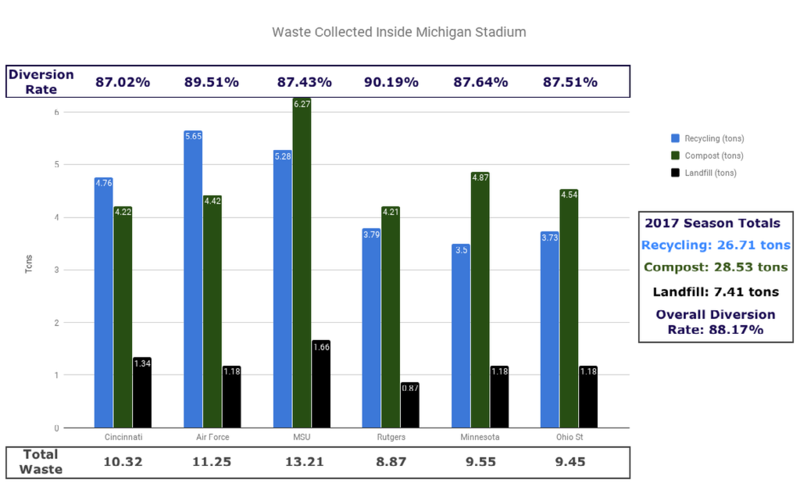 The waste totals for each game were based on waste collected inside the stadium gates only. Waste collected outside the stadium did not factor in to the yearly totals. Bags of waste are collected throughout the game and taken to dumpsters located in the corners of the stadium. On the Sunday mornings following each home game, a cleanup crew comes in and sorts the remaining waste items in the stadium bowl before it is all hauled off to centers for compost, recycling or landfill. Cleanup Crew: Over 400 volunteers from Father Gabriel Richard High School meet at Michigan Stadium. The volunteers check in and collect various items such as leafblowers, rakes, brooms and trash bags to clean the stadium bowl. Informational tables are set up on the concourse to educate the volunteers on which items are compostable, recyclable or landfill. Read the full Photo Recap and Press Release.